Learning how to apply icing on a cake is one of the most fun parts of becoming a cake decorator. Because no one will see the inner layers of your cake until you cut into it, a nice coat of frosting important for good presentation and adds a lot to the taste of your cake. Before you begin, it's helpful to know what type of frosting you plan to use. It's also smart to have a clear idea in mind of what you want your finished cake to look like. A crumb coat is a first thin layer of frosting, usually buttercream, which is spread all around the cake. You can thin this frosting with a little bit of milk to make it easier to spread. The crumb coat usually sticks to any crumbs that may come apart at the edges of the cake. That way, the frosting will be smooth and free of crumbs when you apply a second coat. Before you do, chill the cake thoroughly so that the crumb coat doesn't separate from the cake. Coating a cake with buttercream frosting is the most common choice for decorators and may be the simplest method for how to apply icing on a cake. The frosting has a classic taste that almost everyone loves, and it's simpler and cleaner to work with than fondant or ganache. Set strips of parchment paper on a platter or cake board to keep the frosting area clean. 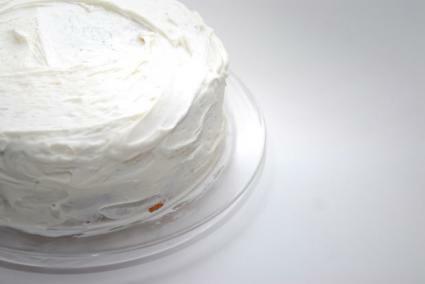 Chill your cake layers in the refrigerator or freezer for 20 to 30 minutes so that they are firm. Cut any curves or domes from the top of the layers to make them even. Brush the cake free of crumbs, and dollop a generous amount of frosting on the top of the first cake layer with a flat spatula. If you prefer, you can use a pastry bag and thick frosting tip to apply the icing instead. Spread the frosting evenly. Top with the second chilled cake layer. Dollop more frosting on top of that layer, and spread. Repeat with more layers if necessary. Flip the topmost layer so that the smooth bottom will be the top of the cake. Apply a crumb coat to the cake. Let the crumb coat sit or chill for 15 to 20 minutes so that the buttercream stiffens slightly. Dip the clean flat spatula in hot water, and then wipe it dry with a dish towel. Dollop liberal amounts of frosting onto the top and sides of the cake, and then smooth with the warm spatula. Fondant is a sugar dough that can be rolled out to form smooth, even coatings for cakes. It's a favorite for wedding cake styles and other elegant occasions. Prepare your own fondant or purchase pre-made fondant from a baking-supply store. Sprinkle a flat work surface and a rolling pin with cornstarch. Roll out the fondant and tint it with gel coloring if necessary. Keep the fondant in a ball, covered tightly with plastic wrap, as you assemble the cake layers and frost them with a crumb coat of buttercream. Let the cake chill, then frost with a thicker layer of buttercream, starting at the bottom of the cake. Smooth the layers with a flat spatula or a pastry scraper. Roll out the fondant to about 1/4 inch thickness. Gently wrap it around the rolling pin and drape it over the cake. Apply gentle pressure all around the cake so that the fondant sticks to the buttercream. Trim excess fondant from the bottom of the cake. 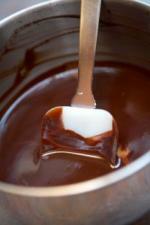 Ganache frosting is a thick, sticky frosting that is made primarily of melted chocolate. It can be applied with a spatula but is traditionally poured over a cake. Let the ganache sit at room temperature until it thickens enough to spread. Alternately, set the bowl of ganache in a larger bowl of ice water, and whisk the ganache until it is thick enough to spread. Use a spatula to apply ganache to a chilled plain cake or a cake that has been frosted with buttercream. You can also choose to pour the ganache directly over the cake. If it drips too far down the sides, scrape off any excess with a spatula.